Applications for Montana Council summer camp’s Counselor In Training (CIT) program are now being accepted. If you are a Scout ages 14 -16 and are thinking about becoming a member of camp staff in the future, this program is for you. The CIT program will help Scouts develop the knowledge, skills and attitudes to be successful, contributing members of summer camp staff. Being a CIT is a great way to discover what it is like to be a member of camp staff and participants in the CIT program are given extra consideration when it comes time to hire staff the next season. The training is conducted through both theoretical instruction and practical experiences during the course of two weeks during the camp season. The program serves the individual by providing an unmatched personal growth opportunity and serves the council by preparing a group of competent and committed potential staff members. 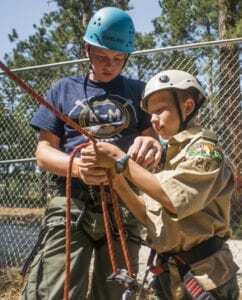 Individuals participating in the CIT program will be given opportunities to earn merit badges while serving at camp as well as receive a $25.00 per week stipend in the form of credit to be spent in the camp trading post on food or gear. All participants will also be provided with room and board during their stay at camp. If you would like to apply to become a member of our CIT program at either Melita Island or K-M Scout Ranch this summer, then please fill out a CIT application and send it to the Great Falls office. Applications are being taken now so hurry and get your spot today. For further questions please contact Shon Ostler by email shon.ostler@scouting.org or phone 406-241-6014. Or download the CIT Application here.